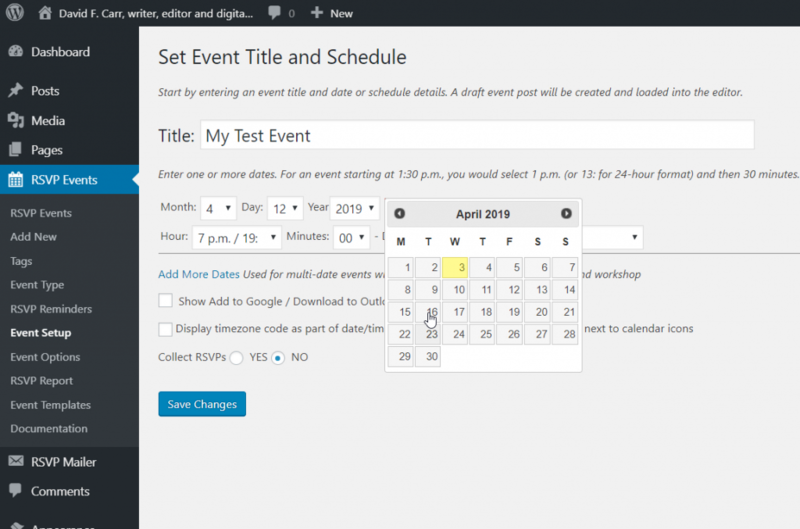 The whole idea behind RSVPMaker is to allow you to take advantage of the familiar WordPress user interface for content creation and editing, while adding the event dates and registration form options that allow you to display even posts on a calendar and/or chronological listing of events, collect RSVPs (or registrations) and charge for events when appropriate. The latest versions of the software have gotten away from trying to cram all the options onto one screen — which I hope is an improvement — but it means you need to understand the relationships between the different screens available to you. The Settings screen for RSVPMaker, which is where you can set defaults for most event options, plus settings related to email notifications, email broadcasts (Mailchimp integration) and payment processing (integration with PayPal and Stripe). The Event Setup screen, displayed whenever you choose Add New for RSVP Events — prompts you to specify the date and time, plus some other key settings (RSVPs on or off?) before filling in the event description details. The Event Setup screen is shown above. The event template variation of that same screen, used to define events that occur on some regular schedule (such as every Friday or first and second Monday) along with the defaults for events in that series (RSVPs on? etc.). The WordPress editor — works the same as for any other post, but with a few RSVPMaker-specific controls in the sidebar and more available through the “admin bar” (the black bar that appears at the top of the screen when you are logged in as an author or editor). The confirmation and reminder messages, which you also work with in the WordPress editor. Look for the admin bar menu items that allow you to navigate back to the parent event post. The RSVP Form, where each registration field is modeled as a special block in Gutenberg. You can add or modify fields, including text entry, textarea, select, and radio button fields, and the optional guest data block. Some of these options may not appear if you are not using Gutenberg, the new editor introduced with WordPress 5. When you save your options on the Event Setup screen, RSVPMaker creates a draft post with the headline, event date, and other basic options set. You can now add whatever body copy you want your event post to have. More event options are presented on a separate RSVP / Event Options screen. When you are viewing a post in the editor or on the website (when logged in), you will see RSVP / Event Options as a link on the admin bar with several submenu items. When you are on the options screen, you will see Edit Event as a link on the admin bar with several submenu items related to customizing confirmation / reminder messages or customizing the form. Default documents show link to RSVPMaker Settings. You can set the default documents for Confirmation Message and RSVP Form from the RSVPMaker Settings screen. 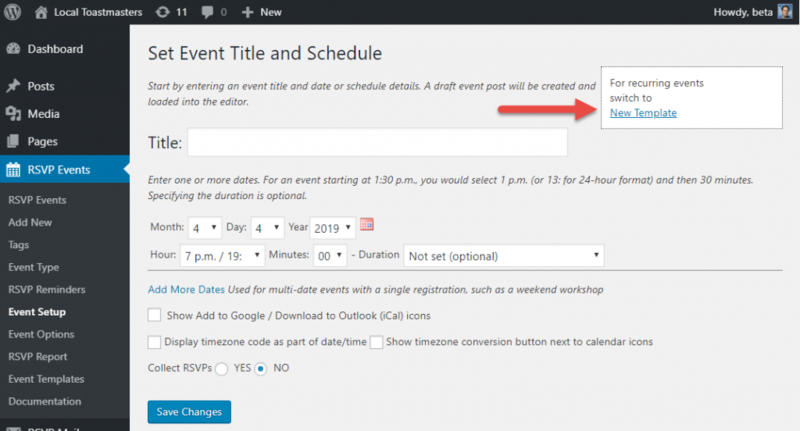 New events you post will use these default documents unless you create custom ones for your event. You can also create templates for specific types of events, with a Confirmation Message and RSVP Form that may be different from your overall default but will be copied to all events based on the template. (More about event templates below). Recommendations: Customize the confirmation message to include details people will need to know to attend your event, such as directions to the venue and a number to call with questions. Change the RSVP Form if the default options don’t make sense for your event (for example, when registering attendees at a webinar, the guest fields probably aren’t necessary) and to gather additional information, such as the name of the person who referred the attendee to your organization. Custom documents show a link back to the Parent Event. 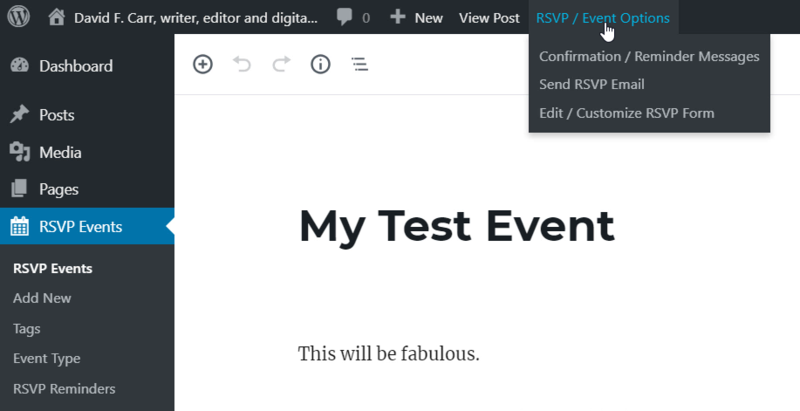 When you create a custom Confirmation Message or custom RSVP Form for a specific event (or template), you will see options to allow you to navigate back to the parent event (in either viewing or editing mode) on the admin bar. When you edit the form, each form field is represented as a content block with properties including Label, Required, and Include on Guest Form displayed in the sidebar on the right hand side of the editor. (More about the form editor). Link to create a template rather than an individual event. 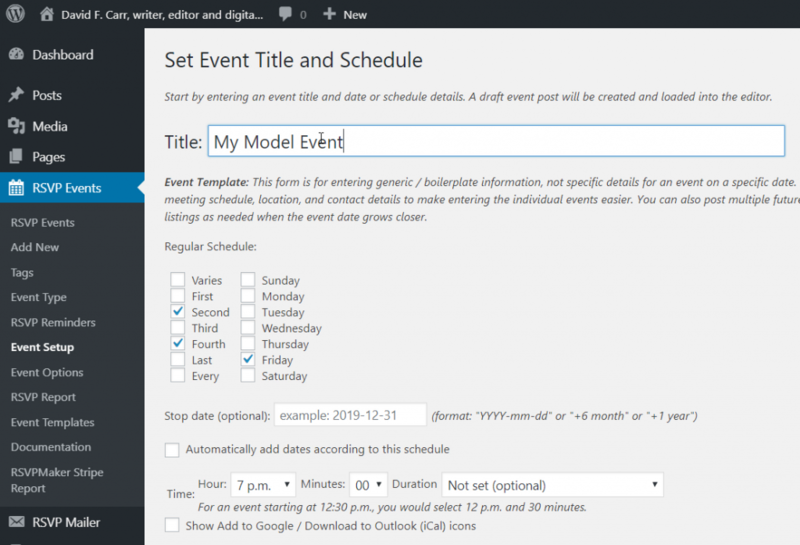 To create a template instead of an individual event, look for the New Template link on the Event Setup screen. You can also go to the Event Templates screen and click Add New at the top of that page. Create / update link displayed after saving a template. After you enter your template content and save it, you will be prompted to “create / update events” based on the template. The template itself isn’t meant to appear publicly on your website and won’t be included on the calendar. Think of the cookie versus the cookie cutter. The template is a cookie cutter, which you can use to stamp out many cookies and then decorate them individually. But you don’t eat the cookie cutter. Templates typically include “boilerplate” details that are the same for all your events, or almost all of them. Checkboxes to add multiple events based on a template. The create / update routine allows you to create one or more events based on your template. Both the body copy for the event and the associated settings (RSVPs on/off, confirmation message, etc.) will be copied. You can create many events according to your schedule and then add details to them as each event date draws closer. For example, you may publish a whole series of events for a club or professional organization, then add the names of speakers when you want to promote a specific event. Updating previously created events, based on a template. 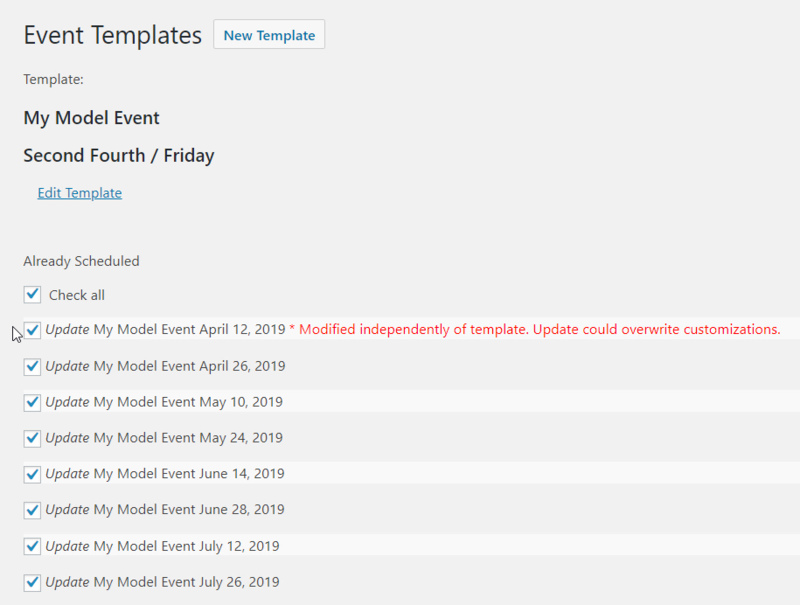 When you update your template, you have the option of updating all the events based on the template. An example would be if your standard meeting location changes, or you now want people to call a different number if they have questions. RSVPMaker tries to warn you if any of those events have been modified independently. For example, perhaps we’ve added speaker or activity details to the April 12 event shown above. We might want to uncheck that one and make any modifications to it manually. Viewing your events on the calendar. If all goes well, the result is an interactive calendar that allows you to promote and organize your events more effectively. Please direct questions to the support forum on WordPress.org. Or see the consulting page for available professional services. If you find RSVPMaker valuable, here is one way to show your support. When doing consulting work, I also sometimes ask clients to send me a deposit this way.